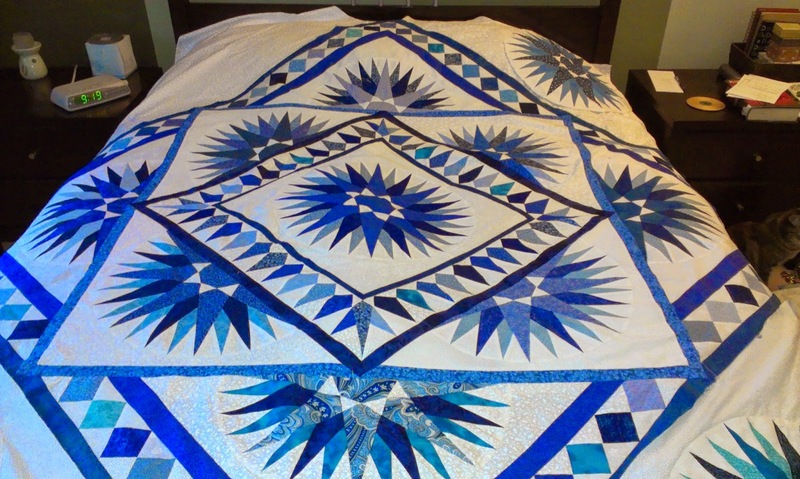 ScrappyBlue Quilts: A whole year already!!?? Wow, it's been a whole year since I posted anything on here .... holy cow, am I ever slack. Despite all appearances to the contrary, I have actually been quite busy this past year. My cousin and my sister both became grandmothers this past fall! 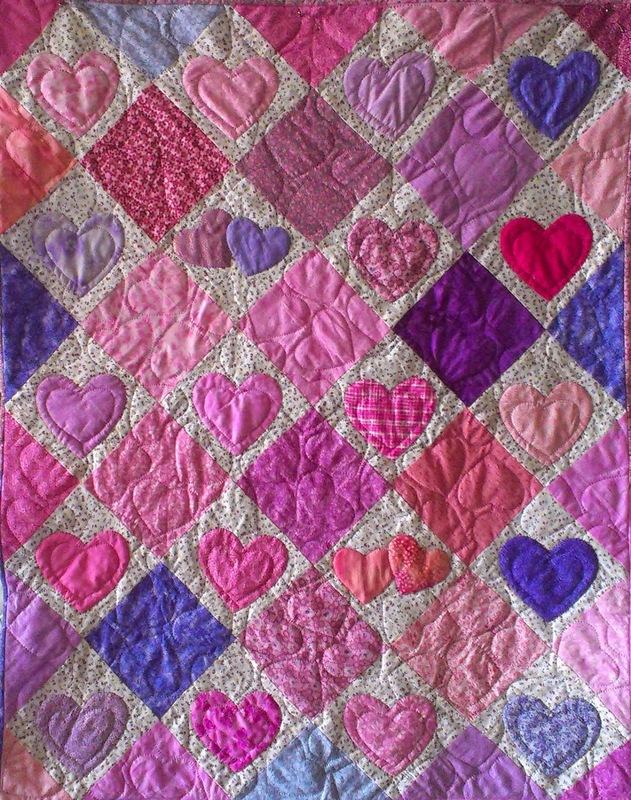 My cousin's granddaughter, Iris Marion's quilt is all pink and purple squares alternating with a light print with pink and purple hearts appliqued on them. I quilted hearts into the background. 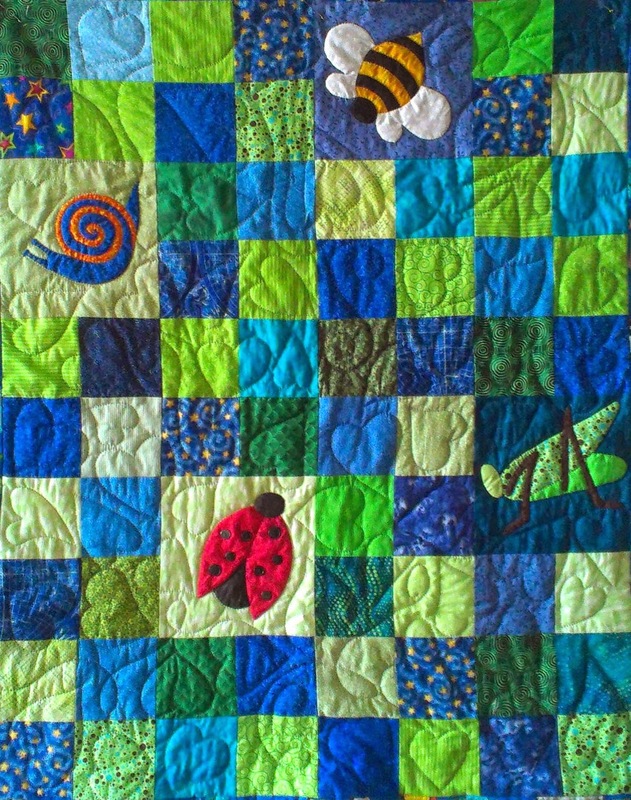 My sister's grandson Amos's quilt is blue and green with an appliqued bee, snail, ladybug, and grasshopper. 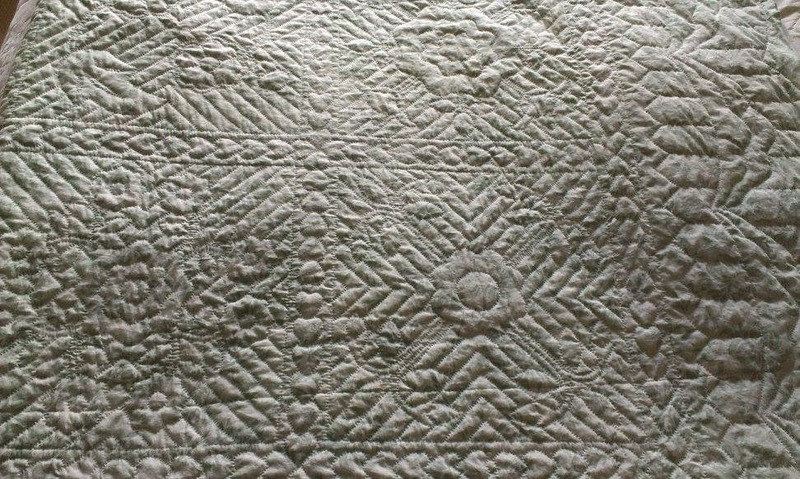 Swirls and hearts are quilted into this one. I was pretty sure I was going to catch fire while working on it ... my eyes burn just looking at it ... but he's quite pleased and it's hanging in the office now with his NHL quilt. I named it "Booooooo!!" 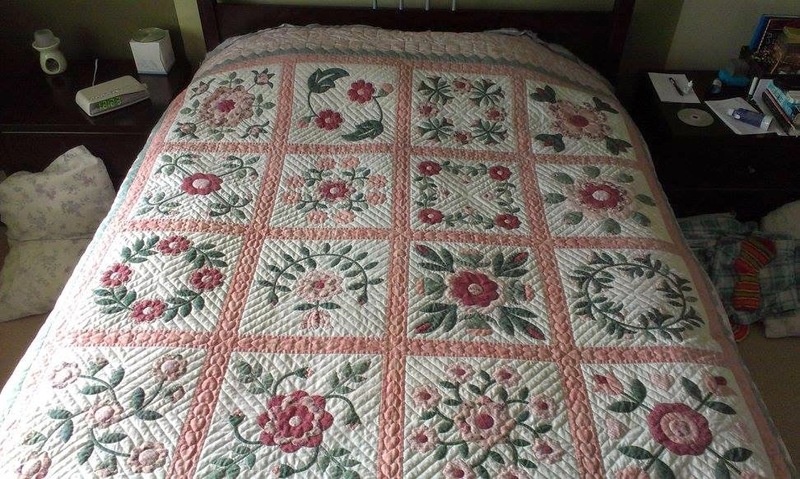 Besides these smaller projects I have mainly been working on quilting Janet's queen size quilt. It's from Rosemary Makhen's book "Rose Sampler Supreme". Janet had actually met Rosemary and taken her course on this pattern a few years ago. 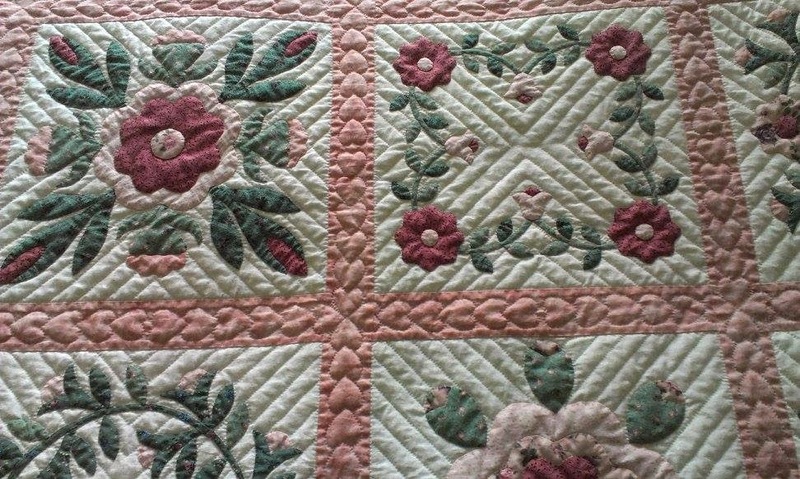 I quilted each block in the ditch around each appliqued piece, then the V grid repeated in each block with hearts in the sashing. 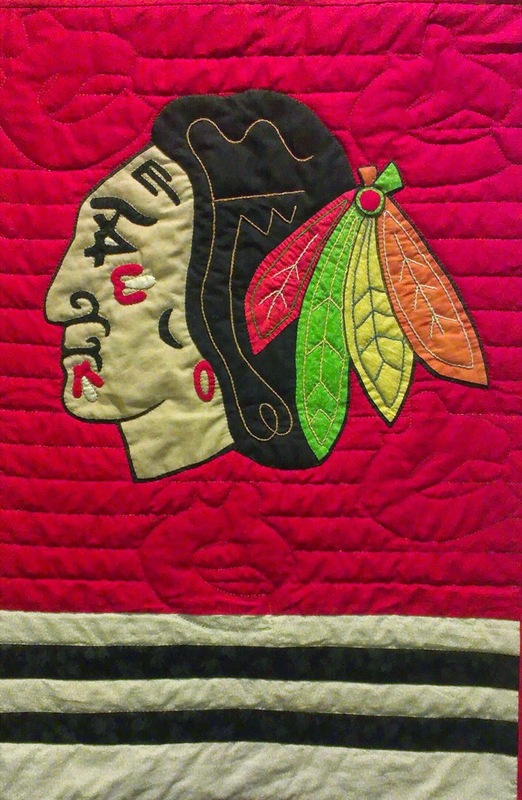 I started it in August 2014, worked on it pretty steadily with a few breaks here and there to do the baby quilts and the evil Blackhawks for christmas, then back to the roses once those were done. I'm very pleased with how it turned out ... the backing print is perfect for this quilt's colours and the pattern in it doesn't overpower showing off the quilting from the reverse side of the quilt. I broke a couple of toes last week, so I'm giving myself a week off and then I'll be off to the races again on another one ... I'll give Wendy a call soon, she's been so patient waiting for me to be ready to start working on hers. So far on my week off I've finished the applique on my living room table runner, got some applique done on my Detroit Red Wings banner, some ideas started for possible ebay sells, and I've started getting my Mariners Compass a bit more ready for quilting. I'm hoping to enter it in my guild's Quilt Show this fall. I have to sew the corner half-compass blocks on, and now I'm appliqueing multi-blue hummingbirds randomly throughout the quilt. I honestly don't know if I'll have it ready for the show, but I'm going to do my level best to try. Wish me luck!